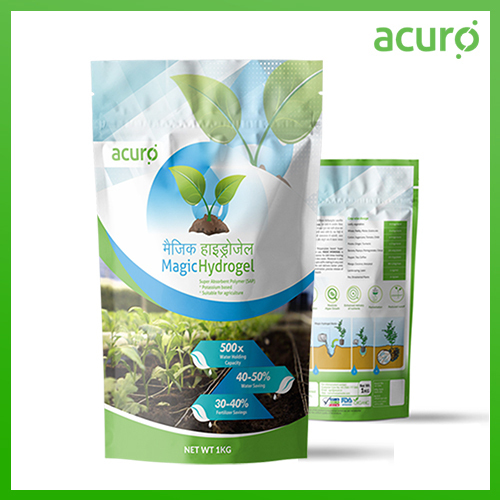 With consistent research and successive advancement in technology, we have formulated this Hydrogel to tackle all on-field problems in agri-sector. The enormous use of fertilizer claimed its utmost use. It reduces the absolute fertilizer dependance (sharp 30-40% reduction) and halves the irrigation frequency. Endorsed by proficient agricultural scientists, it boosts the soil porosity which eases the permeability and assures stability. A biocide: checks algal and fungal growth. Disease Resistant: its weather flexibility lowers the possible disease attack. Germinator: results prior germination with a healthy start. Optimizer: excels production in the arid and semi-arid region. Auto-functional: used in both scarcity and surplus water availability. Amplified Aeration: excellent anti-caking property. Accelerates white and moisten root growth. Absorbs water and necessary nutrients. Assured 5 years life span guarantees 3000 cycles of absorption and release.